Brooks' marketing pitch: A monster of support, stability and cushioning. Midsole: Compression molded, quad-density EVA foam. Harder medial post in twin density, BioMogo foam, full length DNA Gel insert, plastic support shank, 12mm heel drop, the works. The big daddy of all pronation control shoes, full loaded. Heavy and firm with a snug fitting upper - you'd need to half upsize forward and sideways. What’s in a name? In this case, a lot. Around eight years ago, when we first thought of starting a shoe review website, one of the biggest challenges was deciding what to name it. Anyone who’s ever had to deal with naming something knows how mind numbing that process can be. Because you want something which is unique, yet sounds easy enough to roll off your tongue. It is more complicated with domain names, because most of the good ones are already taken. But we managed to brainstorm a list of over two dozen potential names, and then finally zeroed down to two. One of those names (not the solereview one) was taken, so we sent the domain owner a generous offer, but never heard back. So in the end, we ran with solereview. In retrospect, the turn of events worked out just fine. We were helped by an excellent book about naming convention called ‘The making of a name,’ by Rivkin and Sutherland. It delves into the science of names, like what differentiates a good name from bad, and other finer aspects of that art. The book also talks about ‘descriptive’ names, the latter describing a characteristic, purpose or appearance of the product or service. Solereview is a good example of that name category, and aligns perfectly well with what goes down here. By now, you must be wondering what does this anecdote have anything to do with the review? 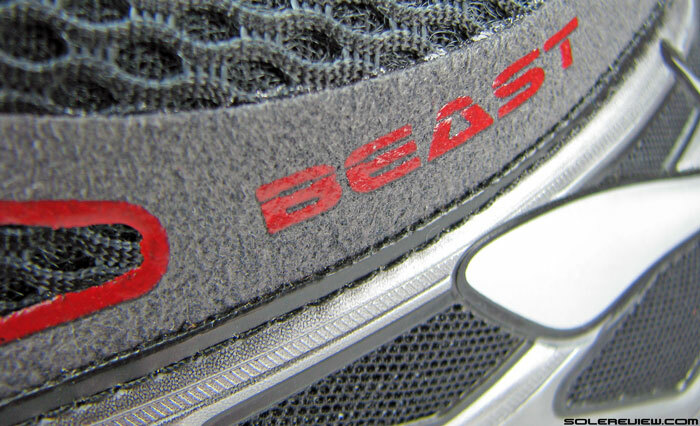 We thought it was worth a mention because the shoe in focus today is called the ‘Beast’. And if it conjures connotations and images of something with monstrous built, then you’d be right to think so. Built like a truck, and it’s heavy at 15 oz for a half pair of US 11. For the Beast is truly a monster of a running shoe. At 431 gms or 15 Oz for a US 11, this Brooks shoe has the weight of nearly two Hoka Cliftons, and easily the heaviest shoe we’ve ever reviewed. It is built like a truck, akin to a Dodge Durango of running shoes. This is for those runners who want the fully loaded version of a stability and support shoe, when lesser shoes simply won’t make the cut. Brooks has hit this shoe with everything they’ve got. You name it, and it’s there. The Beast might be expensive at $150, but you need to see what this shoe packs in for that price. 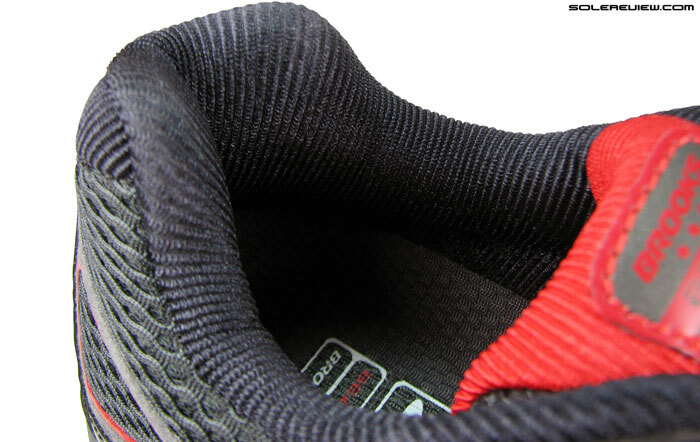 For example, the midsole alone has four different foam densities, and eight different components. The upper is no laggard either, using top grade materials and construction, no expense spared. If you were looking for signs of cost cutting, then doing so on the Beast ’14 will prove to be an exercise in utter futility. The shoe oozes with premium materials everywhere, and the high price sticker seems quite justified. If you want to have some fun, compare this with the flimsy $150 Hoka Huaka. As far as the ultra stable/support category is concerned, this is one of the last remaining shoe models currently available. Just know who this shoe is for, because not everyone will like the Beast. This shoe is the last word for a ‘maximal’ pronation control shoe, delivering support by means of exaggerated stability features. Somewhat of a nineties throwback if you ask us, evoking stability shoe silhouettes of prodigious visual bulk. The midsole is the key element which defines the Beast’s ride character, so let’s have a closer look at it first and see how it performs functionally. The Beast ’14 relies on a familiar trick to deliver the motion control benefit. 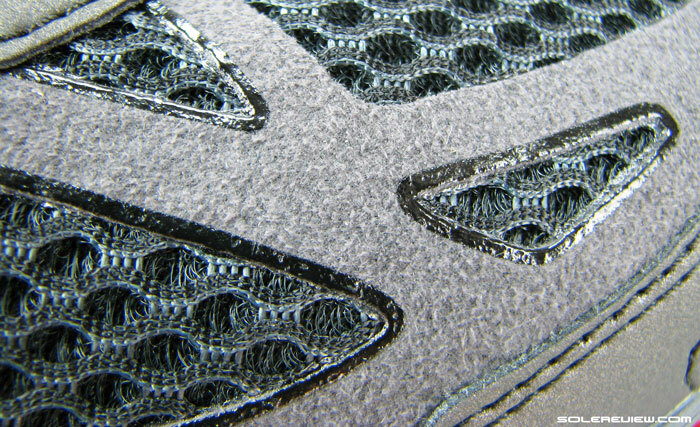 The midsole has four different foam densities, going from semi-soft to hard. (Red-White-Red-Grey). Like most stability/motion control shoes, the Beast 14 uses a combination of multiple midsole foam densities, except that Brooks stretches this concept with four different hardness levels. A huge, grey section (firmest in Beast’s midsole) is inset on the medial side, leaving little doubt of the shoe’s purpose. If you let your eyes follow the midsole curve’s journey towards the lateral (outer) side, you’ll notice the red colored foam layered between the grey and white section. The red foam is softer than grey, and firmer than white – making the latter the softest (relatively speaking) part of the midsole. 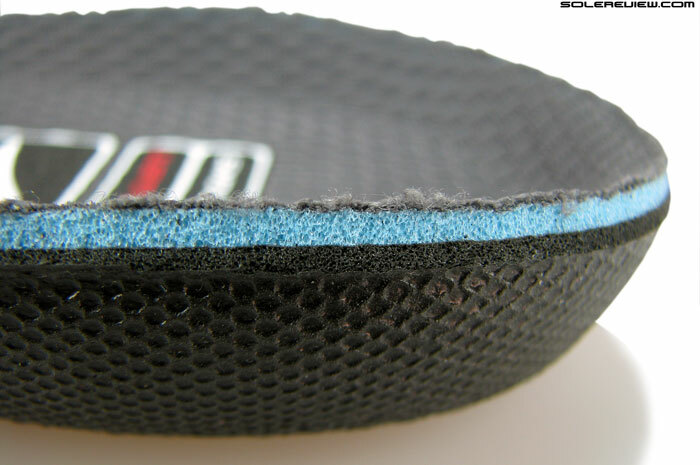 This is a well established design element, that of varying foam softness influencing foot roll. 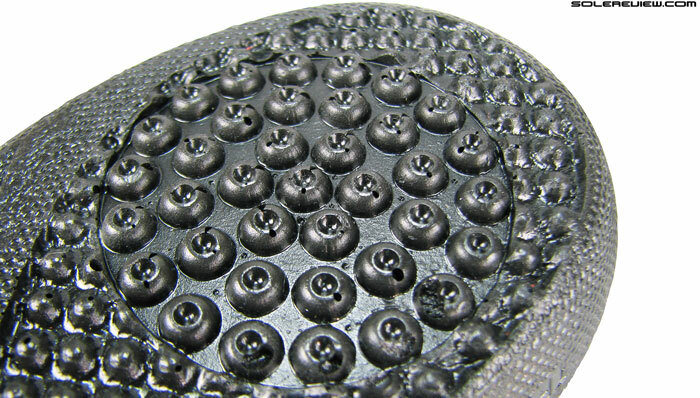 The design of graduating foam firmness from outer to inner side is the cornerstone of any motion control shoe, used with the aim of reducing inward foot roll. A couple of other examples would be the Brooks Adrenaline GTS 14 and the new Nike Zoom Structure 18. The GTS 14 has a quad density midsole, while the Nike makes do with three. Brooks calls this the ‘progressive diagonal roll bar’ or simply ‘PDRB’. Beast ’14 has a heel crash pad on the lateral side. 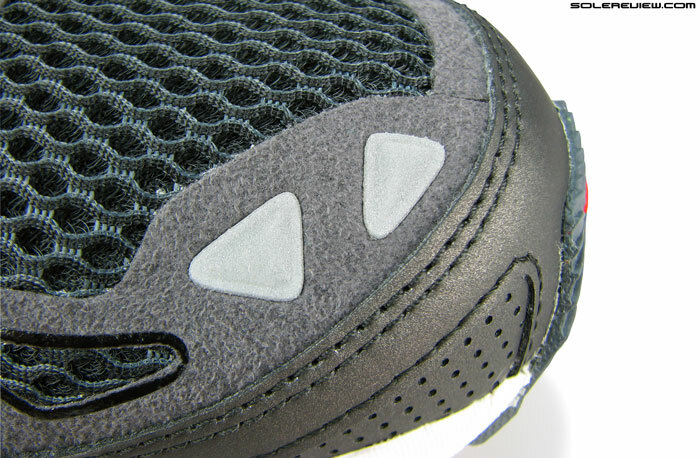 It also has a separate foam component on lateral (outer) forefoot. And lest we forget, the Brooks Beast has two crash pads. 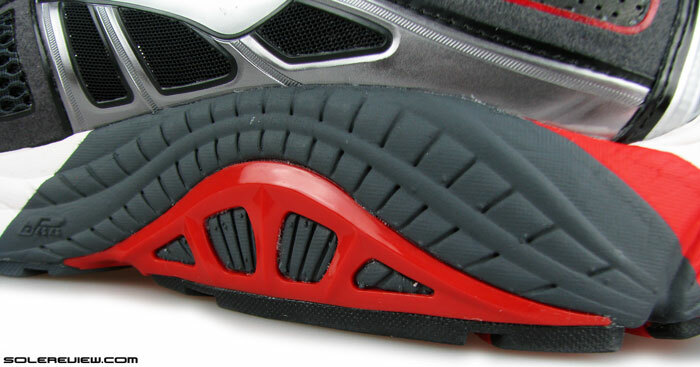 There’s a red one right on the outer (lateral) side, and another which extends (laterally) from midfoot to forefoot. It is important to call out that all these (five) foams are very firm, notwithstanding the difference in densities across colors. This is in contrast to some stability shoes in which there’s a marked difference between foam softness on medial and lateral sides. 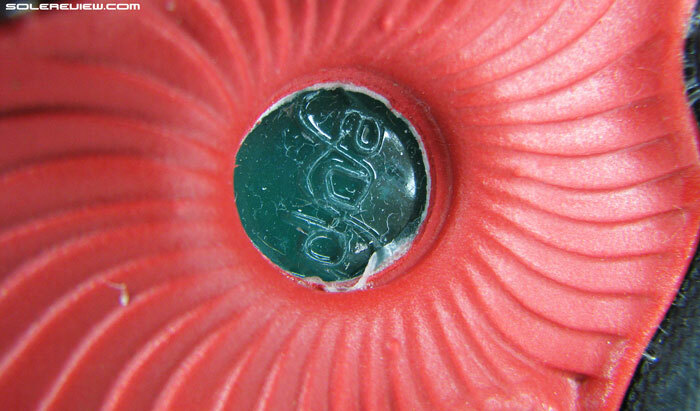 The plastic midfoot shank also forms a part of the medial post for stability. There’s also a huge plastic support piece in the midfoot which wraps the bottom of the outsole. It also extends upwards (and backwards) on the arch side to embed itself over the firm (grey) foam in an arch-like shape. The outsole footprint is huge on the Beast; the area under midfoot is completely filled out, and only slightly less wider than rearfoot. The forefoot looks wide, but isn’t any more so than regular shoes. Outsole has a wide girth around mid and rearfoot. All rubber outsole, of uniform hardness. 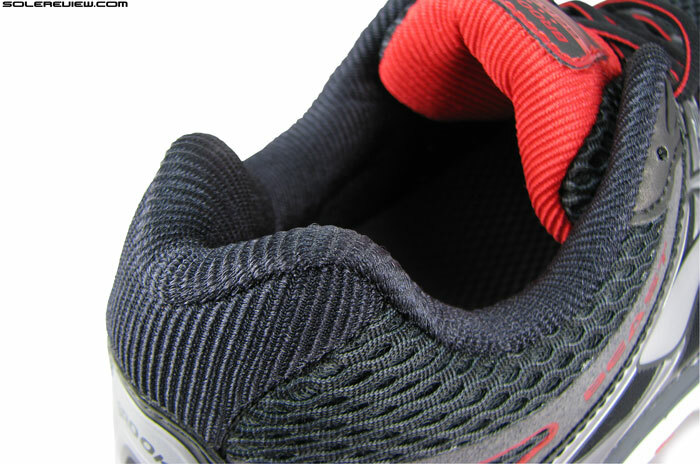 The forefoot midsole is made of two foam densities. Forefoot midsole is dual density, the medial side being softer white foam and lateral a combination of (red) foam insert under white. 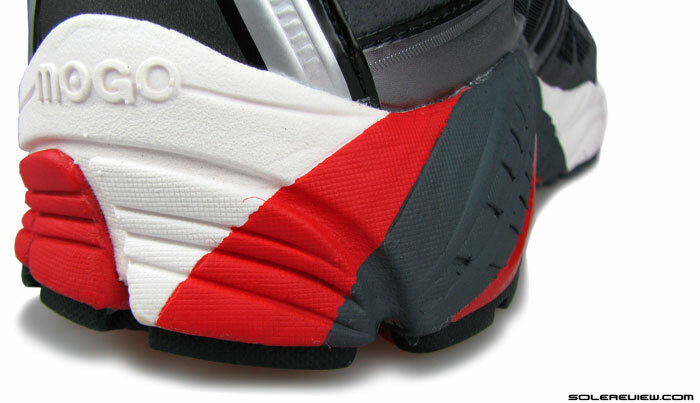 So if you turn the shoe over, you’ll notice the forefoot split equally along the center in red and white. The Beast’s got a few flex grooves, but it remains a very stiff shoe – due to sheer thickness of the material used. 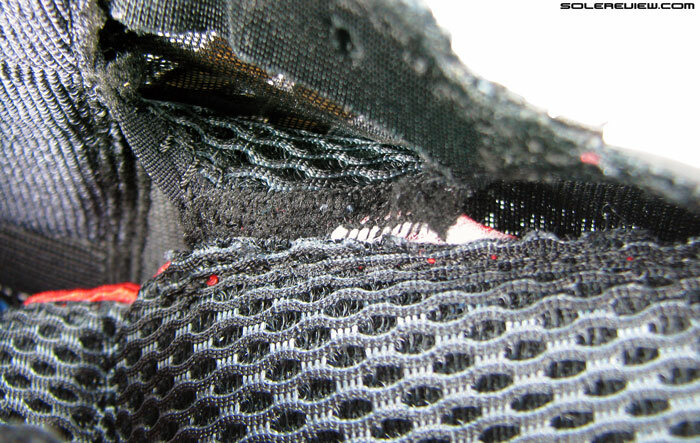 Inner half of the forefoot uses a filament mesh kind of material sandwiched between the outsole and midsole. You can see this going over the flex grooves; not sure what this meant for. It is possible that this material adds extra stiffness to the (softer) white side, trying to compensate for the firmer density of the red half. 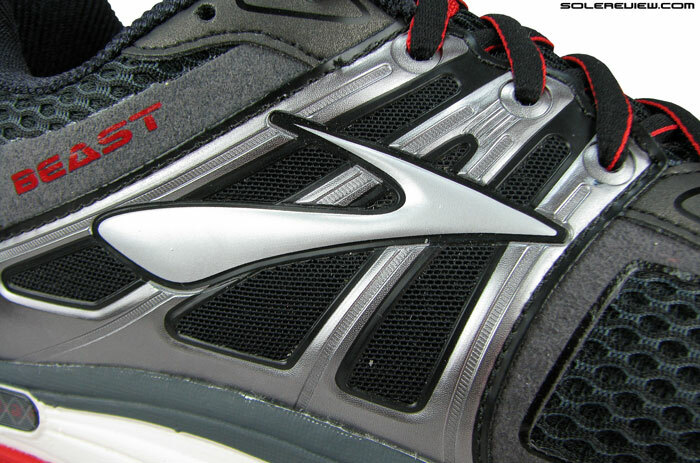 Beast has a DNA gel insert, a material which adapts to footstrike pressure. This is a reference for how a full length DNA looks like. This image is of Glycerin 9. For cushioning, the Beast ’14 depends on a full length insert of adaptable DNA gel. This is different from the new ‘Super DNA’ foam which has been in the news lately. This is the old school, original DNA which has non-Newtonian properties – the ability to change viscosity based on footstrike pressure. In simple words, the DNA gel is soft when walking, and turns firmer when things speed up. A great youtube video which explains this is here. The image above shows you how the DNA looks like inside the shoe – the picture is that of a Glycerin 9 tear-down. Broad rearfoot with semi-segmented crash pad. Semi because there’s only one groove (top right) separating the heel rubber from rest of the outsole. 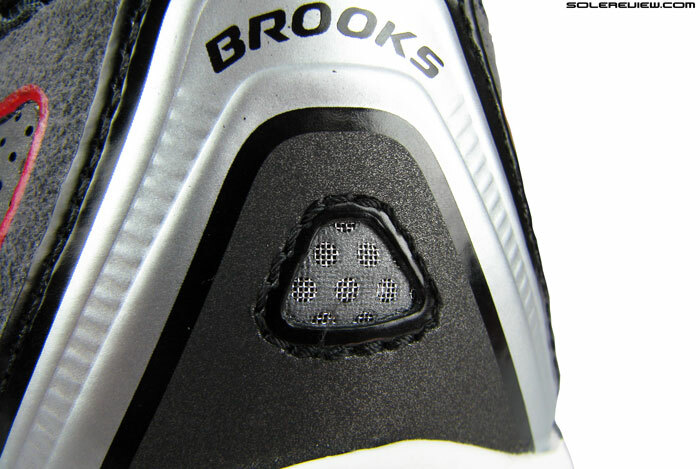 Plenty of coverage on the outsole, with the entire surface being hard rubber – no blown rubber under the forefoot. 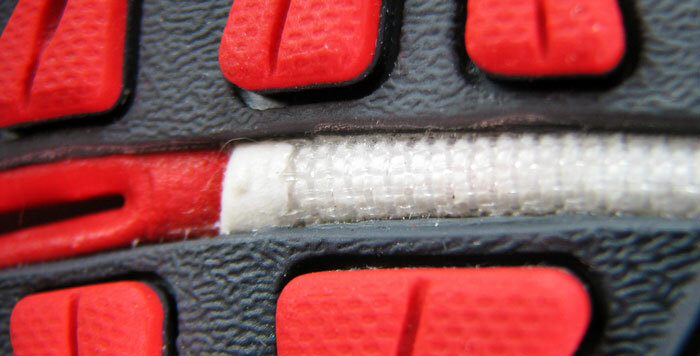 This is also a near-full contact outsole, except for the small midfoot gap covered by the plastic shank. 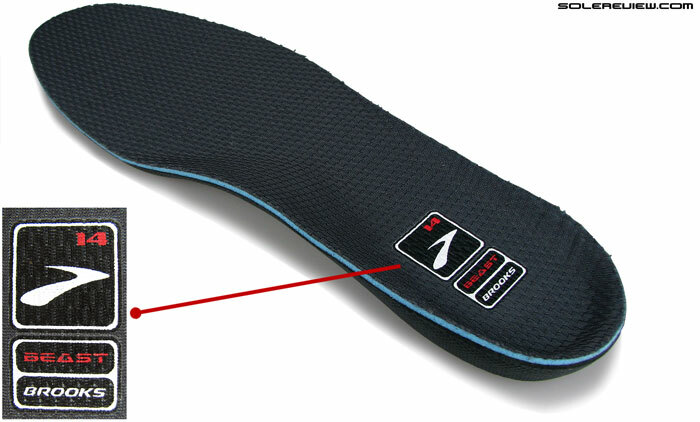 Heel part is partially segmented by a groove, making it something which can be described as a semi-crash pad. Rubber durability has always been something which Brooks shoes has been found lacking in, and the Beast ’14 doesn’t fare any better. Rubber will undergo some level of shredding around the footstrike area, even just after a few runs. This looks like Jelly filling, and the Beast is constructed similarly. Soft center DNA embedded in a firm foam casing. The ride is a bit off the beaten track, as there’s a curious meld of stiff and cushioned. 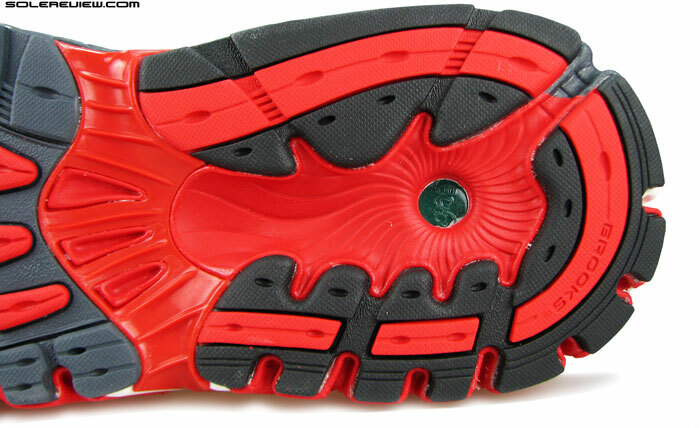 The foam sections are unyielding and firm; the DNA gel insert makes foot strikes relatively cushioned. Being what it is, the DNA material feels softer during slower speeds and yet decreasingly so during runs. Non-Newtonian, remember? The cushioning feels extremely centered every time you land in it; the lateral bias is barely noticeable as the midsole foam walls resists collapsing. The insole is amazingly plump and cushy. Three layers of molded materials. The base looks and feels like Polyurethane, Silicone and EVA blended together. But really, we’re not sure what the exact material here is. You also have to consider the generously thick and padded footbed, which can put many aftermarket orthotics to shame. It is a three layered (fabric, foam, foam) drop-in piece with molded contours. Not really sure what material the base is made of; looks like poured foam (due to pores on its surface), but with a very silicone-ish feel to it. The thickness makes the insole extremely well padded, and also forms the larger part of the shoe’s under-arch support – which by the way is excellent on the Beast ’14. Beast ’14 comes with great arch support. The sockliner volume also makes it ideal to be replaced by most aftermarket Orthotics in case you did not like the stock insole. You should be able to do so without impacting the default fit, as it is unlikely that replacement insoles will exceed the height of the Beast sockliner. Beast’14 scores high on stability, helped by its larger midsole volume(and girth), lack of lateral bias and overall foam firmness. If you have weight training sessions weaved in along with your runs, then this shoe works perfectly for that. While heel to transition is smooth during runs, the forefoot’s ultra stiff – making non-running duties more work for your foot. With all said, just know that this is the exact same midsole/outsole design seen on the Beast ’12, so while we haven’t reviewed the Beast ’12, it can be safely assumed that the ride will remain unchanged. At the risk of generalizing, we think that this shoe to be a good option for heavier runners seeking a motion control shoe with rock solid stability. 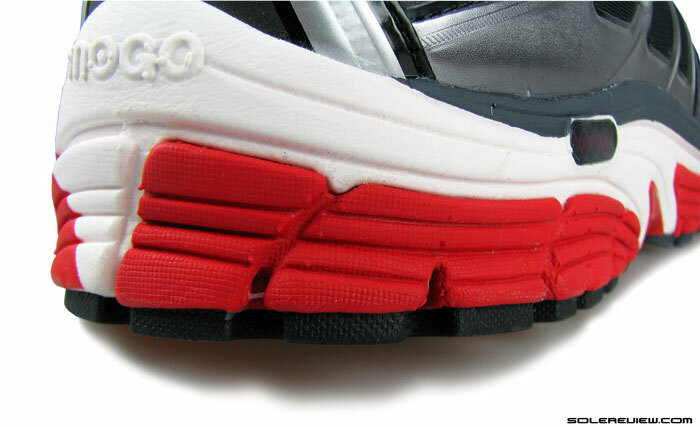 That is why the upper fit came as a surprise, because heavier runners tend to have slightly wider feet. We’ll give it to you straight – you need to upsize on the Beast ’14. Both in foot and width size. If the fact that we had ordered a standard ‘D’ width was unknown to us, we would have assumed that the shoe being tested had a ‘B’, or narrow width. It is tight in the forefoot, even for someone who has feet with normal width. It is almost as if Brooks has used a adidas last for the Beast. Not only that, but the length runs smaller too. 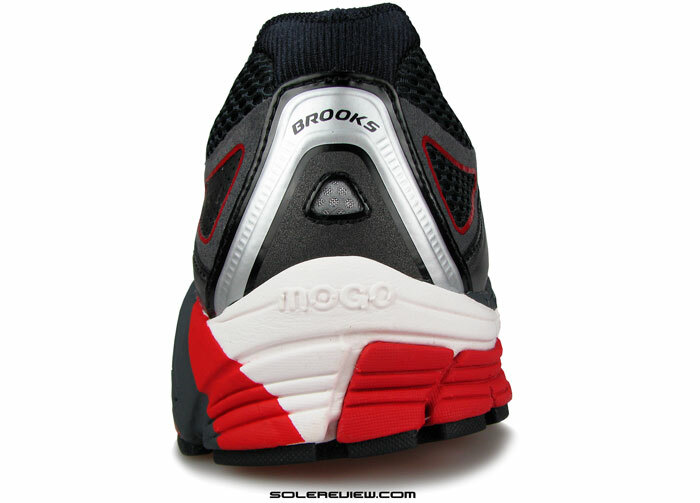 Even when compared to other Brooks shoes, the toe area feels cramped and pointy. We don’t say this in many reviews because of variables involved, but the Beast ’14 is an exception – so we strongly recommend you buy half a size larger and also upsize sideways to at least a 2E (wide). Otherwise this shoe will be good only for shorter running distances; any longer and you’d wish you had a size bigger. The Achilles dip points inwards, gripping the foot tightly, maybe too tight. It would seem that the inward bent of the collar pushes the foot forward, eating into toe space. The shortness in heel to toe sizing can be attributed to the upper heel area. The Achilles dip curves in more than what’s necessary, pushing the foot forward. And yes, that’s another area which will have divided opinions. Some will find the super snug collar area to their liking, while others might find the pressure on Achilles something which they could live without. Tongue comes secured to either sides, so there’s snugness and zero sliding. Otherwise the upper is top work, if you look past the need for upsizing. The spacer mesh’s comfortable, lining has a premium feel all through from tongue to collar, the laces are soft and tongue stays in place as it is attached to the upper. Synthetic nubuck on forefoot and part of rear quarter. Semi-elastic TPU midfoot panels with thin mesh overlays for vents. Reflective triangles on the toe bumper. 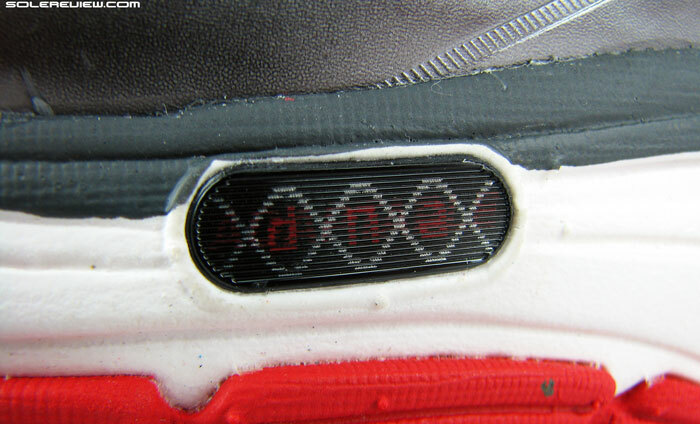 Small reflective underlay on the molded upper heel. The overlays look swell too. There’s a material combination of synthetic nubuck (with printed edges, no less), gunmetal finish synth. leather and stretch polymer panels which result in great midfoot fit. A couple of reflective tid-bits adorn toe the bumper and center of upper heel. Breathability is a-ok for a shoe this bulky, as the spacer mesh comes unlined and stretch midfoot panels have a covering of thin mesh. Know what the Beast ’14 is useful for, and you’ll be a happy customer. Just remember to upsize on this Orthotic of a running shoe. The Asics Forte was an even better example of this type of shoe. Too bad they discontinued it. It was a good-looking shoe, too. It would seem that the new Gel Fortify is its replacement. The $150 shoe looks the part. You site is really a tremendous asset on the internet! Please continue with your excellent reviews. I was hoping for some (need) of your expert advice. The beast is too much of a shoe for me. I was a fan of the older Brooks adrenaline, the 11 being the last one I prefer. I find the ride of the 13 on up to the latest gen very firm. I’m a heavy runner. with some mild pronation and flat feet. I’ve tried on the latest glycerine and kayano. I really like the cushioning of the kayano but find the heel to close to the ground, similar to the saucony hurricane that I didn’t prefer in the past. The new glycerine fits well but too firm. I tried the hoka clifton however it was too narrow with not enough stability. Based on your review, I am now considering the brooks transcend, saucony guide, or adidas sequence. Any guidance will be greatly appreciated. Based on your needs, shoes like the Transcend (narrow+shallow forefoot), adidas Sequence (snug forefoot with no width options), and Saucony Guide 8 (firm ride) would need to be taken off your list. We’d think the New Balance 1260 V4 to be a good fit for your requirements. Try the D width, and if you need more room, you can upsize to 2E or 4E. Once that is done and dealt with, the ride is cushioned, has mild motion control features, and is stable enough. While you’re at it, try the new Asics GT-2000 3 in wide too. Thank you very much for the recommendation. I will check out the NB 1260. Looking forward to your upcoming adrenaline review and hearing your expert take. Will definitely spread the word on this awesome site. You’re welcome! We had to move the Adrenaline review as the shoe needs more time. But it should be online sometime next week. Just wanted to let you know that you nailed it. The NB 1260 V4 are perfect. Exactly the ride and cushion I was hoping to find. That’s great! Happy to hear it worked out for you, happy runs! There is a peculiarity to my foot shape – I have a high arch and my heels invariably wore on the outside. So far the description is copybook – supination- and I wore cushioned shoes for over a decade. In 2011 at a runner’s shoe store in New York, I was examined on a treadmill by built in cameras which found that I had over pronation and prescribed the Brooks Beast. All my reading tells me that if I had over pronation, my shoes will wear on the inside, which they don’t. Also high arch goes with supination. No one is able to clear the confusion. I have now got custom made orthotics. Should I continue with the Brooks Beast? There is nothing pecular with your gait. The problem is with the footwear industry simplifying and over-interpreting bio-mechanical research. Can you believe it, the entire pronation vs. shoes deal started in the 70’s and it exists till this date, with no concrete evidence on whether these ‘neutral’ or ‘pronation control’ shoes make any difference at all. The bottomline is, don’t worry about matching your gait characteristics with a particular shoe type. if you maintain a conditioning regime to keep your musculosketal system primed, you can wear any shoe you want to, as long as the footwear in question fits well, supportive and reasonably well padded. If the Beast’s going strong without causing injuries, then we see no reason why you should change your shoe. Very enlightening. Thanks so much. I’m a moderate/severe overpronator with collapsing arches. My previous shoes were the Beast 12 and the NB 1012 before it (and I’ve been wearing Superfeet Green/Orange inserts in them). Right now, I’m trying to decide between the 1260v4 and the Beast 14. I primarily wear them at work (I’m in a hospital, and thus on my feet for 10+ hours a day on concrete floors), which is why I’m considering ditching some of the support of the Beast for added cushioning (especially since the Beast/Superfeet combo isn’t preventing me from coming home with sore knees). However, I do also run, so I’m leery about veering away from the motion control shoes. Any insight? 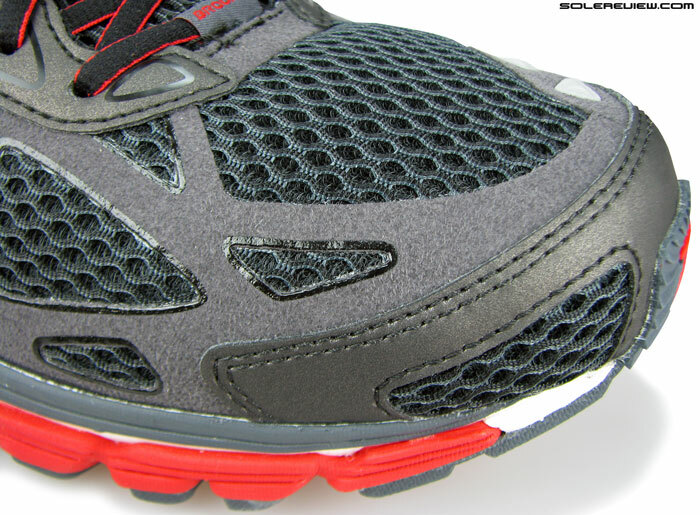 If you want more cushioning in a motion control shoe, then the 1260 V4 is a no brainer. But have you considered the Transcend too? Sure, the fit runs a bit shallow but then the sockliner is very thick, so if the Superfeet is comparatively thinner then some extra space is in order. They will also grip concrete floors better, with less outsole noise. Best way to find out is to take the Beast 12 with Superfeet to a store, swap the insoles and see how the Transcend feels. I found this page some days ago and I find perfect! Love reading the reviews and it will help me a lot from now on as reference for buying running shoes. Right now I’m looking to change my current shoes (Glycerin 12). The problem is that I don’t know what type of running shoes I should wear. The last few years I’ve bought the Mizuno Alchemy 11; Prophecy 2 and 3; and Glycerin 11 and 12, with better results for the Alchemy and Prophecy 2. My predicament exist because I’ve been told (by my orthopedist) that I’m an overpronator but the test on the treadmill shoes that I am more of a neutral runner (Hence why I bought the Prophecy and Glycerin). I have very flat feet and I’m suffering from some knee and ankle pain. I’m looking to buy the Gel Kayano 21, Beast 14 or the Adrenaline GTS 14 since I’m feeling my ankles are rolling more than usual. Nonetheless, I want to know which shoes you would recommend, and If I should go with overpronator shoes (like my orthopedist recommend) or more neutral shoes (as the test say)? Based on your comment, it would appear that you prefer shoes with firmer cushioning. And couple that with your predicament about either buying a pronation control or neutral shoe. To that we say, why not have all three in one shoe? In our opinion, that shoe can be the GTS 14. Has cushioning without the mushiness, there is stability without the in-your-face motion control, and is built solid too. Great reviews and website. The sizing is awful for tthis shoe as you mention. Yes, that is how it works. Width increase in 99% of cases mean only forefoot and partial midfoot increase. The sole width remains unchanged, so in certain cases (like a 4E width), you might sense the feet sliding off the midsole edges. I am a large man to begin with. 6’3″ 350lbs. I’m a garbage man by trade so my job is very physical. I wear a 14 ee regularly. What size should I buy in these shoes? Or do you reccomend another? I have flat feet and suffer occasionally from planter fasciitis due to over pronation and bad shoes. Everytime I’m about three weeks into working out and losing weight I have to stop because of a flare up or ankle soreness. Please help if you can. Thank you. Considering your needs, Beast 14 seems like the right shoe with enough cushioning and stability. But given that the Beast fits very narrow, it would make sense to buy a 4E instead of the 2E which you would normally buy in other shoes. I am a big guy with big feet (4E) who has developed a serious bi-lateral Achilles problem. There are bone spurs involved but we’re going the PT/ injections route for now. The podiatrist suggested a well-padded shoe with a stiff sole. Suggestions? Beast 14, 1260 v4, an Asics? I used to love the New Balance 857 series but they seem to have ruined that shoe. The Beast 14 might suit you, but it runs very narrow – see if the Beast 4E fits you. Otherwise the Saucony Hurricane is another alternative. Sorry we don’t have a lot of testing experience with a lot of heavy stability shoes, we’re sure there are other options available across brands. I am a Fitness Trainer. 6ft 200lb. Im always on my feet (inside, outside) either training athletes or training myself. I’ll run anywhere between 10-20 miles a week, not including sprints or other things. But I overpronate badly, so its been hard for me to find the appropriate shoe for me. And because of it, I’ve developed plantar fasciitis in one foot and in the other one my posterior tibial tendon bothers me. They aren’t as bad as before because I’ve purchased soles and a ankle braced. They helped a lot actually . But As I’m sure you know, not many shoes are made for people as myself. But I want to know do you think the Beast 14 is good for someone like myself, and/or are there some other shoes more suited for me? Thanks for your time. Yes, the Brooks Beast seems to be right based on what you describe. It has tons of support with cushioning too. It runs very narrow, so worth trying out the 2E too. 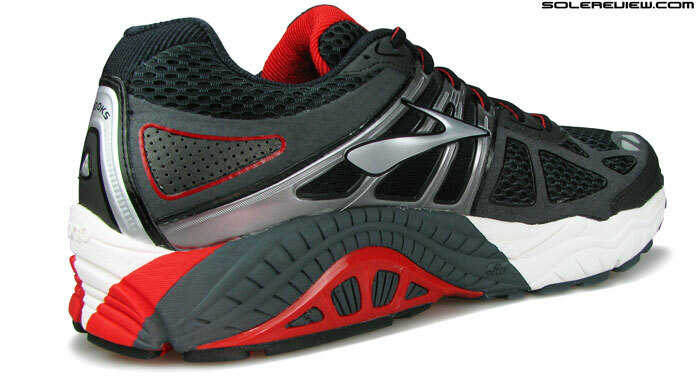 You could also try the Brooks Transcend 2, which has plenty of plant/wide base, and combines cushioning and support. Feels neutral, because it does not really have any pronation control features built in – like a medial post, but nevertheless feels supportive. Thank you for sharing your ownership experience here! Will help other readers in a similar situation as yours. Hello Katie, thank you for your question. From your list, we’d select the Brooks Beast 14, which has a very stable ride without compromising on cushioning. However, since the Beast 14 is not available in Womens, you would have to opt for the Ariel 14, which is basically the same shoe, but in women’s color. As with the Beast 14, we’re assuming that the Ariel 14 runs narrow too. Hence advisable to go for the Extra Wide 2E option, which is available too. If you need a softer level of cushioning, the Asics Kayano 21 is a good bet, and if you like a lighter model, then the adidas Sequence 7 Boost is a good alternative. Hope this helps, and wish you success with your goals! Hi. I have been diagnosed as having sesamoiditis under my big toe and I’m looking for a shoe that will protect this area of my foot. I was told a stiff soled shoe would be best for me. Do you have any recommendations regarding which shoe would work best for me? A few options with a firm forefoot would be the Mizuno Wave Rider 18/Inspire 11, Saucony Hurricane, and yes, the Beast 14 too. You could try all of these, but just know that the Beast 14 runs very narrow, so a 2E width upsize will be in order. I’m a heavy runner (6″1, 220 lbs) with flat feet and pretty bad overpronation. Looking for something that is really good at cushioning impact and that’ll be a little easier on my ankles and knees. 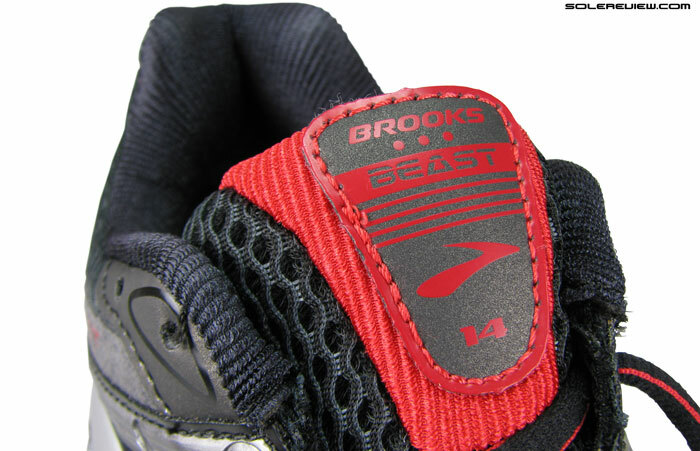 Right now, I’m looking at the Brooks Transcend (or Transcend 2) and the Brooks Beast 14. I’ve had the Brooks Trance 12 in the past, and while I really enjoyed running in them, I’m looking for something with a bit more cushioning/impact absorption. What would you recommend from the two, or even shoes from other brands? Thank you so much! While the Beast 14 is the last word for a stability shoe, the Brooks Transcend is the one you buy if you need more cushioning. It is very supportive too, and its only negative vs the Beast is that there are no optional widths. Try to see if you can get the Brooks Transcend 1, which we liked better than this year’s T2. This review (and the whole site in general) is great! Last time I bought running shoes (I’m an occasional to avid 1/2 marathoner) I was sized, tested and told to get the Brooks Dyad 7. I need heel stability and cushion. I am also suffer shin splints easily. The Dyad 7 (double E) worked great, but I am wondering if if should go with the Dyad 8 the Beast or the transcend? I’d like a “lighter” “flashier” shoe, but I don’t want to risk the loss of stability (the Dyad 8s are so blah). Haven’t reviewed the Dyad, so have no idea on how that compares with the Beast or Transcend. That having said, the Transcend seems like a suitable candidate for your needs; slightly ‘flashier’ and has plenty of support. Don’t know about the Dyad, but the Transcend is way lighter than the Beast 14 too. Thanks! Even if the Transcend wont do “perfectly” for running I have a cool stable shoe for the gym. Thanks for all the great info! I’ve got flat feet with collapsing arches, I’m 6′ 215 lbs and have plantar fasciitis. I’m looking for a pronation control shoe that I can wear doing cardio exercises and running/walking. Basically I plan on doing Power 90 cardio program which involves a lot of jumping and time on the balls of your feet. Doing this with improper support caused my plantar fasciitis initially, so I want to ensure I’m getting a shoe that will properly support my foot and arch while doing these exercises which involve much more lateral and cross body movement vs straight forward running. Would you recommend/suggest the Beast or the Adrenaline GTS for this purpose? Thanks for your help in picking a good shoe, especially given how expensive they are! If you need under-arch support and overall stability, nothing comes to close to the Beast 14. It might be a good idea to check out some cross training shoes which provide lateral stability with a flat sole – more suitable for the kind of workouts you describe. We don’t know of specific models, but no harm in trying out a few and seeing how they compare to the Beast in fit and feel. Hi there, so based on your assessment of the sizing, if I am a size 9.5 in a Brooks Adrenaline 15, should I go size 10 in the Beast? Correct. Disclaimer: The length is ok on the Beast, the width is not. Just after any advice at all if possible please? I’m running in vomero 10’s and doing about 15-20 miles a week on the road. I’ve been getting sore arches for the last few months and pain on the inside of my lower legs. I’m a neutral runner with low arches but have always been recommended neutral trainers. I tried asics gt2000-2 recently as advised to stop the lower leg and feet pain but they seemed to give me slight buttock pain and seemed too firm and didn’t really help any foot problems. Just wondering if beasts might be worth a try as cushioning seems best for me but too much cushioned seems to hurt my arches (like Skechers run ultras). I’m 5 11 and about 200 lbs. Thanks, David. Great website by the way! just my two cents, get a pair from the brooks website direct, they have a 90 day return policy if unsatisfied, and free return shipping. Thanks for your reply Godlike. I live in the UK and not sure if they offer that service here but I’ll investigate. Nothing to lose!! The Brooks Transcend is certainly worth a try. The Beast might be too much of a shoe. I noticed Nike Lunar Glide 6 on sale at Nike outlet for $50 — Brooks Beast 14 is now $150. Both shoes SoleReview score 9/10 on stability. Sensory score card changed to more detailed after LG6 review, making side by side comparison a judgement. Do any other stability / motion control shoes measure up to the Beast, especially Nike who has many outlet stores? You could try the Nike Zoom Odyssey. Less bulky than the Beast and feels less supportive, but your best bet within the Nike line. The Lunarglide 6 is no comparison to the Beast 14 when it comes to stability. I am new to running and I have been looking for a shoe to fit my needs. Since October of 2015, I have lost 40lbs. I started a Get Phit Challenge in January and it ends on March 19th with a 5k. After all of that, I am still at 225lbs and 5′-10″, I have flat feet and a serious pronation. Not knowing a lot about what shoe I needed, I bought the Asics Nimbus 17. I liked the shoe, because it was light, but I found out that it did little for my stability issues. I bought them with very little help from the from the associate at a big box sporting goods store. This weekend I went the a smaller sporting goods store, Omega Sports here in Burlington NC. The associate was so knowledgeable and helpful. I measure my feet and asked me a lot of questions. He ended up showing me the Beast 14, size 13 4E. I was apprehensive because of the $150.00 price tag, after just spending $140 on the Asics. I told him this and he said that he would give me a 20% discount. I did buy them, and I am glad that I did, this is a great shoe. That night I did a 5k on the treadmill at the gym, as a part of my practicing for the real thing. I was very happy in the way the shoe performed for me. The stability is amazing, which was my major need. So, if you have similar issues as me, than I highly recommend this shoe. Thank you so much for sharing your purchase experience – very helpful!